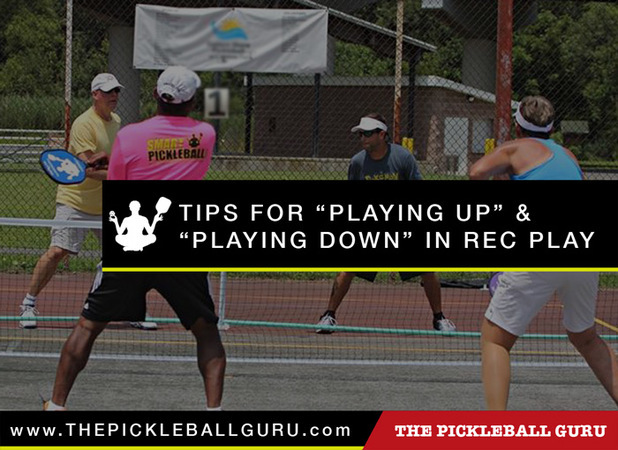 Here are some general pickleball etiquette guidelines, which address these questions and more. Ask at the Beginning or End of the Day. Approach when they are warming up or cooling down. DON’T go when they are in the midst of a streak of higher-level play. Accommodate Their Flow. If you do approach them in the midst of higher-level play, accommodate their flow. Ask “Hey, do you mind if I get a game in with you all before you quit today?” so that they can continue playing, but will hopefully commit to playing with you later. Hit to Them! No one likes to watch their partner hit all the balls during recreational play. The higher-level player is doing you a favor by playing with you, so hit the ball to them at least half the time. It will make you a better player, make it more fun for them, and make it more likely that they will play with you again next time. Don’t Be Obnoxious. We all play our best when we play with better players. When we play with weaker players, it can be challenging to stay focused, so remember that they may not be playing at the top of their game. Or, they may be focusing on improving their own shots, rather than on winning. Show Your Appreciation. If they give you feedback on your game, have an open mind and be appreciative of them taking the time to play and help you. Remember Where You Came From. Who took you under their wing when you first started playing? Chances are you’ve improved your game since then by getting to play with better players, so pay it forward and make a point to regularly play with players who are weaker than you. You could regularly play a warm-up game with them, or once a week decide to dedicate the last 30-45 minutes of your play to playing with them, it’s up to you. Just find a way to pay it forward. If Now’s Not Good, Say When. If someone asks to play with you and you opt to play a higher-level game instead, let them know when you WOULD be willing to play, perhaps later in the day, or later in the week. Don’t Be Patronizing — Or, Overly Aggressive. Instead of focusing on who wins or loses, find a way to make it challenging for yourself. Pick a shot you want to improve upon and focus on hitting that shot. Or, try to reduce your number of unforced errors. Focus on consistency and keeping the ball in play rather than slamming every put-away shot you get. Like these tips? Want to share them with your group or club? You can thank my wife, Wendy, for creating these easy-to-print 8.5′ x 11″ mini-posters to post at your pickleball venue. Just click here to open and print the PDF. I have been playing pickle ball fro several years now. I have learnt a lot and have always enjoyed it. i like the way more experienced players welcome and encourage new players. I have a really hard time with players who treat the public courts as their own fiefdom and slam everyone who is not of their opinion or not at their level. That is why you r article on playing up or down is very good. I would not like the game of pickleball to become what I am seeing on tennis courts. For the reasons of surlyness, injurious exclusivity and bad sportsmanship, I have all but stopped playing tennis. Thank goodness for pickleball. Long may it thrive. This topic is and always will be a difficult one to deal with and is one I’ve seen from both sides of the net. Some clubs allow players of any skill level to play with each other which sometimes works well, other times not so well. I have seen better players leave the courts and even call it a day knowing they would only have lesser skilled people to play with. Other clubs have the courts identified by skill level and do not encourage one to “play up” until they can play at the level that is designated on each court. I have seen 2.5 or 3.0 players deciding to play on a 3.5 + court only to be picked on relentlessly by the better players on the other team simply to give them the message they were not good enough to play on that court and not really welcome. It is not fun for either side but certainly does not promote the good sportsmanship that the game of pickle ball is famous for. I know being able to play with better players will improve your game and I for one appreciate those opportunities. But we all must realize that the better players also want to play with players as good or even better than they are to give them a challenge and to improve their game also and we should respect that. Anyone who is serious about getting better, should not try doing so only by playing with better players. They should take lessons and then put those lessons to work by regularly practicing and drilling. That will develop the muscle memory needed to be able to make many of the shots that you see in a typical game situation instinctively quite often without having to think about it. Pickle ball can be a very fast game at times with quite a variety of shots. Our reactions need to be just as fast which does not allow for much, if any, time to think about it. The absolute best way to become better and have a well rounded game is to have a program of drills that make us work on the shots we can make regularly and more importantly, shots that we need far more work on to be able to hit them all consistently. Thanks Prem! Always enjoy your tips. When I play with beginners I try to practice the shots (drop, dink etc.) I need to practice too.